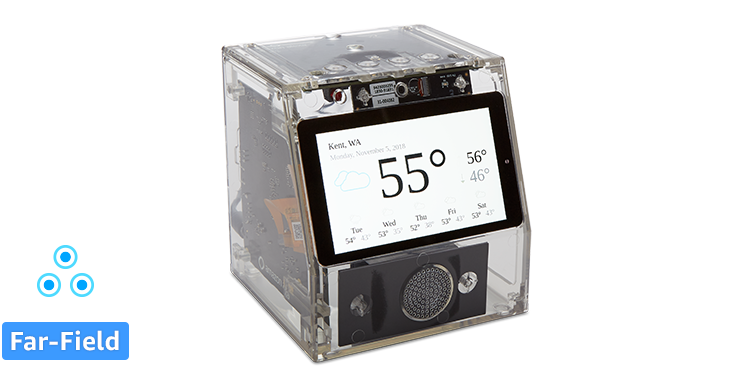 With the Amazon Alexa Smart Screen Dev Kit, Amazon is enabling commercial device makers to build high-quality screen-based products with Alexa built-in. The dev kit provides a complete hardware and software system reference solution with the latest AVS technologies, including support for interactive screens with rich visuals, Alexa Multi-Room Music (MRM), Alexa Calling & Messaging, and more. Based on a production-ready ARM Cortex-A53 chipset that hosts the Alexa client software and audio front end technology for ‘Alexa’ wake word detection, this kit features a 4” touch screen, 3-mic array for far-field speech recognition, and includes the new Alexa Smart Screen and TV Device SDK and sample GUI. Please speak with your Amazon AVS business development contact, or fill out the request form below, if interested in requesting the Amazon Alexa Smart Screen Development Kit.